BLOOMINGTON — A simple yet forceful love of reading pushed a Chiddix Junior High student to raise nearly $3,000 to help fill school libraries in the Twin Cities. 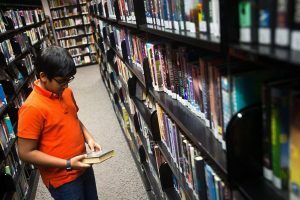 For his annual community service project as a McLean County Diversity Project scholar, 13-year-old Revanth Reddy Poondru started Blo-No Books and targeted the libraries in underserved elementary schools. Revanth’s mother, Sneha Vemula, started teaching him how to read before his teachers had a chance, and he hasn’t put down books since. His father, Srini Reddy Poondru, brought home piles of books as Revanth grew up. Revanth searches for a book to check out Thursday, Dec. 13, 2018, at Normal Public Library. His parents estimate he has read hundreds of books, and he always has a few in his backpack. He read through them so quickly even the librarians couldn’t believe it. “Whenever I read, I like travel into another dimension, kind of. I experience different things in my mind that you couldn’t experience here,” he said. His parents estimate Revanth has read hundreds of books. He always has a few in his backpack. 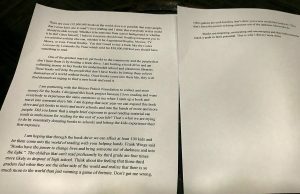 “So that’s why I just wanted everybody else, not just the elementary schools but anywhere, to experience reading and to have actual good reading material,” he said. So Revanth took his head out of his books long enough to collect $2,831.02 in personal donations over the last year. The money was split between Irving and Sheridan elementary schools in Bloomington. He fell short of his goal of $5,000, but Revanth hopes to expand the project next year, bringing in corporate sponsors to help as many students as possible. Srini said he is proud of his son and his efforts to give back to the community. “When he had the idea, I really liked the idea because he wanted to help the people in this community first and he chose a good cause — to improve the reading habits of elementary kids,” he said. With the donations, Irving Principal Messina Lambert said the school will be able to purchase special-interest books and “bulk up the library” with material the students are sure to enjoy for years to come. The new books at Irving will be plated with a sticker indicating they were purchased with the funds from Blo-No Books. Lambert said they will replace some of the older books removed when the library is revamped over the summer. Revanth is still accepting donations for Blo-No Books. Donations can be sent to the Illinois Prairie Community Foundation Book Drive at 915 E. Washington St., Suite 2, Bloomington, IL 61701. To support the Blo-No Books drive online, click here. 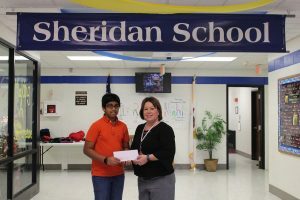 Revanth Poondru presents a check for $1,415.51 to Sheridan Elementary School Principal Jennifer McGowan to purchase library books for the school. 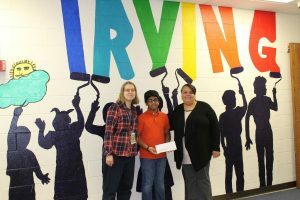 Revanth Poondru presents a check for $1,415.51 to Irving Elementary School Media Specialist Kerrie Huizinga, left, and Principal Messina Lambert to purchase library books for the school.